Marquise Linnear is proof that someone from any zip code in Chicago can make it at one of the country’s top universities and have a career with his passion: math. With every math equation he solves at the University of Illinois, Marquise Linnear wants to be a beacon of hope for the West Side of Chicago. It’s not been an easy journey. Linnear, 19, a freshman math major at the U of I, was 12 when his father was fatally shot. And at age 14 he was stabbed, attacked and robbed of his cellphone by four boys in Garfield Park. Linnear said growing up near Lawndale and Austin, he heard gunshots almost every day. Most days, he was afraid to leave his house. He said he survived a traumatic childhood to honor his father, to be proof that someone from one of Chicago’s roughest neighborhoods could make it at one of the country’s top universities and simply to have a career with his passion: math. 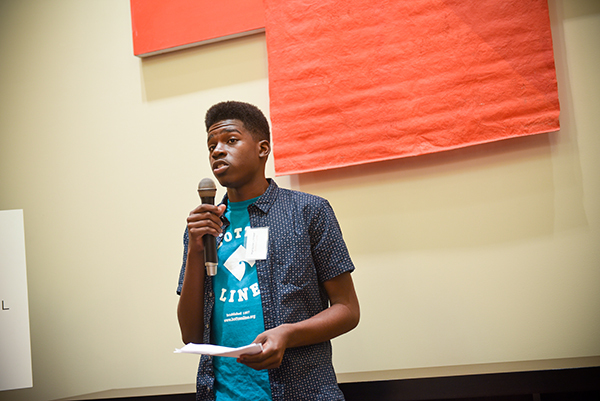 Linnear receives a substantial amount of scholarships and grant aid to attend the University of Illinois, thanks to Bottom Line, a nonprofit that helps first-generation students from low-income backgrounds attend and graduate from college. Linnear first heard about Bottom Line when he was a sophomore at Westinghouse College Prep, and he worked several hours a week for over a year with his counselor, Emily Rivest, on college essays, applications and interviews. Linnear said if not for Bottom Line, he likely would be attending community college. Founded in Boston 20 years ago, Bottom Line’s Chicago office opened nearly four years ago, and the students in the program have a college persistence rate of over 90 percent. This year the program is serving more than 1,000 students in Chicago, with a wait list of 500 students. “At Bottom Line, we know our students have what it takes to go to college,” said Blenda Chiu, Bottom Line’s director of programs. Linnear said he’s in college because of his desire to never get discouraged by his circumstances – and to never quit. His father, Anthony, was murdered at a Lawndale party in February 2012. Linnear said, in the years before his father died, he would hold his son to a higher standard than others in his family, knowing of Linnear’s passion for math that started when he was 5. Linnear is also an accomplished dancer – serving as a captain for Westinghouse’s dance team in addition to participating on its pom pom and majorettes squads. While he was walking home after a dance class in August 2014, Linnear was attacked by a group of teens. One of the attackers grabbed Linnear’s cell phone, and when Linnear fought back, he said three others hit him, and one stabbed him with a knife in the right shoulder. After a trip to the hospital, Linnear was petrified to even leave his home. With math, Linnear quests to become an actuary at an insurance company – a business professional who deals with the measurement and management of risk and uncertainty. He expects to graduate from Illinois in 3½ years. He would become the first in his family to earn a college degree. The documentary Derek Grace made about Spencer Elementary Technology Academy's annual College Week can be seen on America ReFramed.